You know why expanding Medicaid in Utah makes sense. Now let’s examine the five most common arguments from those who don’t want to. Crowd-out is the fear that people currently covered by private or employer-based insurance might drop their coverage and enroll in a newly expanded Medicaid program. This could happen two ways. First, employers stop offering insurance coverage to their employees who then enroll in Medicaid. Second, people covered by private insurance drop it for Medicaid. According to this argument, a system with easier access to Medicaid will “crowd-out” the private insurance market. It seems logical from the perspective of a spreadsheet. But it misses some key points. First, the crowd-out argument assumes that most people who will qualify for Medicaid are already purchasing private insurance—or get employer-based insurance. But the majority of low-income individuals eligible for Medicaid expansion do not have access to affordable private health insurance. As reminder, a single person making 138% of the federal poverty level (FPL) earns $15,900 a year. A family of three earns $27,000. Purchasing average private insurance would cost them between 15% and 19% of their annual income. A single person making 110% of the FPL earns $12,600—or $242 a week. Add in rent, car payments, gas, groceries, clothing, and utilities—and paying for private insurance isn’t possible. The same budget squeeze applies to the small percentage of low-income workers who can purchase employer-based coverage. Remember the McDonald’s personal budget story from last summer? It assumed health insurance would cost $20 a month. But monthly premiums for many employer plans exceed what low-income people can afford—so they skip it. Another argument against Medicaid expansion is that a person earning between 100% and 138% of the federal poverty level (FPL) won’t be able to choose a private insurance plan. Instead, they will forced to enroll in Medicaid. Here’s how it works in a state with expanded Medicaid. If www.healthcare.gov or the state screening process determines a person is eligible for Medicaid (i.e. earnings between 0% and 138% of the FPL), they could choose between Medicaid and a private insurance plan. However, if they chose a private plan, they wouldn’t be eligible for premium subsidies to make it more affordable. Why? Because the super-nerds at the CBO decided it was a better deal for taxpayers to steer the “100% to 138% FPL” crowd to Medicaid rather than give them premiums subsidies. It saves taxpayer money. Plus, these consumers have at least one option for affordable health insurance–Medicaid. And here’s how it works in a state that hasn’t expanded Medicaid. If a person earns under 100% of the FPL, and isn’t pregnant, disabled, over age 65, or a parent—then they don’t qualify for anything. And if they try to purchase a private insurance plan on the marketplace, they can’t get premium subsidies to make it more affordable. Which scenario is less fair? We’ll let you decide. But we meet Utahns who fall into this “Medicaid Gap” all the time. Reason #3: Can we afford it? Expanding Medicaid will impact Utah’s budget. That’s a fact. In the short term it will create an $11 million budget surplus for Utah. Over the long term the revised PCG study predicted that expanding Medicaid would cost the state between $25 and $35 million annually over the next ten years. The debatable issue is whether Utah is ready to make this investment in its health-care economy and its people. Plus, if Utah decides to expand Medicaid, we could include a “circuit breaker” in the legislation to freeze coverage if the federal government drops its share of matching funds below the promised 90% threshold. What if Utah turns down the Medicaid expansion and nothing changes? People don’t collapse in the streets. Hospitals don’t close their doors. Low-income workers don’t flee the state. It’s the same concept that played out in the mid-1990s when states reformed “welfare as we know it.” Traditional welfare went away and life (except for some people) continued onward. Could the same result happen if Utah refuses to expand Medicaid? What if no one wants to sign up? The “nothing burger” thesis is the opposite of the “crowd-out” argument, but it’s often suggested by the same people. Plus, Utah’s slow pace of enrollment on healthcare.gov (357 buyers by November 2nd) is raising concerns that people lack an appetite for new insurance options—including Medicaid. 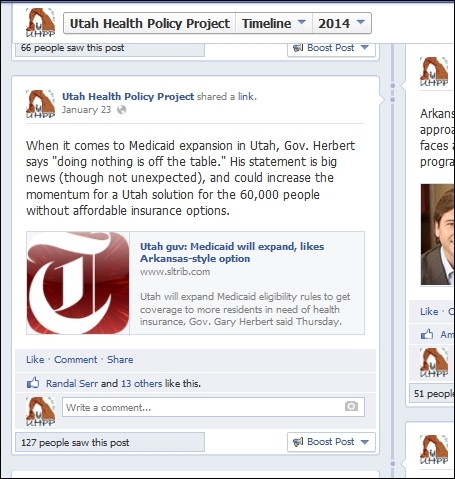 After all, the PCG study suggested 123,000 Utahns could gain new health insurance coverage if Utah expanded Medicaid. 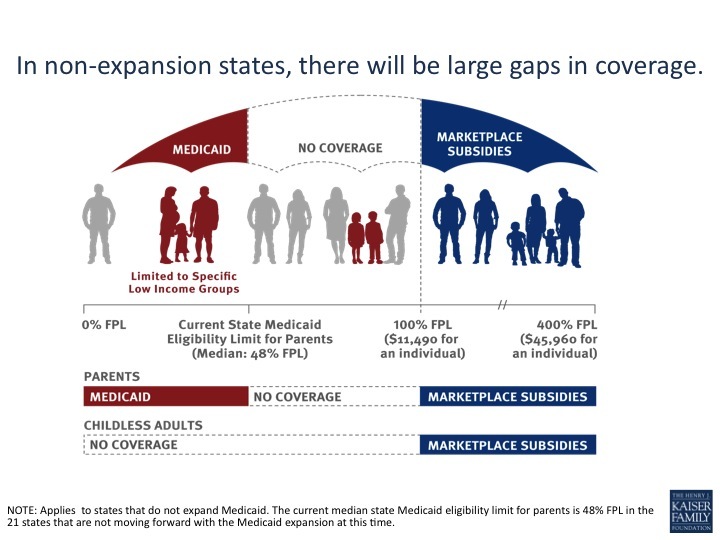 However, Utah’s slow marketplace enrollment isn’t a predictor for Medicaid expansion. It’s a predictor of a faulty website at www.healthcare.gov. During the same time that 357 people signed up for private coverage over 4,800 Utahns were deemed eligible for Medicaid or CHIP. We suspect that many more applied through myCase at Utah’s Dept. of Workforce Services—the destination that navigators and state workers promoted as a faster alternative to the federal website. Other states are experiencing similar Medicaid enrollment spikes. In Arizona, 11,000 people qualified for Medicaid. Plus, 17,000 in New Jersey, and 10,000 in Wisconsin, which isn’t expanding Medicaid. If Medicaid expansion is a “nothing burger,” then lots of people are still trying to take a bite.